The WEN 3962 Two-Speed Band Saw with Stand and Worklight has flaws but its excellence makes up for them. According to my observations, band saws that are 9-10 inches are flimsier to their monstrous and beefier counterparts, but in exchange they're also many times less expensive than the other models. The one you should pick depends on what sort of cutting you'll be doing with your band saw and whether or not you actually need something so huge it takes two men to lug it around. Its amazing cutting ability and high cut capacity of 6 inches, which makes it as strong and deep as a standard table saw but more maneuverable in terms of curved and variable cuts. The 3.5 amp motor doesn't only cut 6 inches deep; it can also make 9¾ inches cuts in width. It operates at two speeds: 1,520 and 2,620 feet per minute (FPM). It bevels up to 45° and has a spacious work table size of 14⅛ by 12½ inches. Its 9-inch and 10-inch variants are flimsy than the 14-inch version. Frustrating to adjust and set up at times. Compared to a table saw, a band saw (even the huge 14-inch ones) is supposed to deliver superior flexibility in terms of cutting. To be more specific, the band saw should deliver more cut variations such as freeform cuts or curved cuts a la a jigsaw but with the strength, stability, and straightness of a table saw. The jigsaw will always have the reputation of offering curved cuts reminiscent of the puzzle named after it (the jigsaw puzzle). However, the band saw is able to outdo the jigsaw in terms of cut stability and the ability to do straight cuts (which is more difficult to accomplish with a jigsaw by its nature and design). I typically make use of the band saw when I want to do smaller cuts that are impossible to do with a table saw or deeper cuts that you can only otherwise do with a table saw. The band saw is able to outdo scroll saws, radial saws, circular blade saws, or even chainsaws because of its versatility. It's not only the best of both worlds of the jigsaw and table saw; it's the best of all worlds including other saw variants. Sure, when doing specialist work, it's better to go with something specifically designed for the task, but the band saw is known to be versatile because it's a jack of all trades. The WEN 3962 Two-Speed Band Saw is mostly made for woodworkers and metal fabricators as well as your typical construction worker. It's also used by those employed in steel mills, the timber cutting industry, and so forth. It sees plenty of use when cutting down long rails on the roof, conduit, and industrial pallet racking and anything else as long as they're work pieces you can bring over to the unit versus pipes and tubes that are already installed. The WEN 3962 is a heavyweight (especially the 14-inch model), but that only means superior cutting stability. The unit won't wobble over the place as you make your cuts. As far as I've seen, many of the reviewers who've reviewed this band are homeowners and hobbyists who do woodworking and DIY home improvement as a hobby and professional metal fabricators or carpenters. There are no butchers who've reviewed it but it's also been written from the articles I've read that band saws like the WEN 3962 Two-Speed Band Saw also get plenty of usage at the meat shop. That's why I recommend this unit for everyone who are in need of the cutting power of the table saw mixed with the cutting versatility of the jigsaw combined in one unit. As for the benefits that the WEN 3962 stationary saw should have, here are just some of them. One of the key advantages that the likes of the WEN 3962 stationary band saw has over table saws is the lack of kick back when you used it. You have to be more wary when using a table saw to cut your work piece cleanly in half or quarters. Meanwhile, stationary band saws with stands offer the same stability as table saws compared to their power tool counterparts. Instead of buying a tool you can afford but outgrow as you do more elaborate work is not good economics. While buying the 10-inch or 14-inch versions of the WEN 3962 Two-Speed Band Saw can leave a healthy dent on your bank account, it's a good starter saw for in-depth cutting (especially the 14-inch variant that's the closest version to a table saw). In order to make short work of wooden work pieces, pipes, and conduit, you should find a model with good blades (or even a sharp general-purpose blade that comes with the machine) and a decent amount of speed. Speaking of decent amount of speed, the WEN 3962 has you covered with its twin-speed motor that can go 1,520 or 2,620 FPM. It even comes complete with a miter gauge, fence, 3-in-1 dust port, and work light. Before buying the WEN 3962 Two-Speed Band Saw with Stand and Worklight, consider the following. What Are You Going To Use The Band Saw For? If it's for residential and light industry or woodworking and timber-cutting use, you can immediate satisfaction out of the WEN 3962 Two-Speed Band Saw right out of its box. The way I see it, you may need sharper blades for usage in a metal fabrication factory or mechanic's shop to cut through thick metal. As for meat cutting, you need a stainless steel blade to go along with your band saw unit for easy cleanup. Band saw blades are classified by points per inch (PPI) or teeth per inch (TPI). For wood turners, 3 TPI is good enough to handle green wood and carry away saw dust to avoid clogging. You can also avail of "extra set"blades that have more set on the teeth than the average blade. This is highly recommended in woodworking circles as well for fine-toothed sawing every time. What Sort of Motor Does Your Band Saw Have? You should have a motor that runs at one horsepower at least so that ripping down billets from logs or cutting round turning blanks won't end up testing the utmost limits of your unit. Anything less than that could ruin your band saw, limiting it to smaller work pieces and less thick material for cutting because it has a hard time cutting cleanly over green hardwood blanks. In fact, the more HP your band saw motor has the better. The WEN 3962 Two-Speed Band Saw with Stand and Worklight is a stationary band saw with a wide table surface to carry the heaviest or most irregularly shaped of work pieces and a high-power two-speed motor that can create cuts that are 9¾ inches wide and 6 inches deep. Aside from the impressive cut capacity, the motor also runs on 120 volts of power. The WEN 3962 Two-Speed Band Saw has some specific features and benefits that make it stand out from the rest. The stand and its 73 pounds of heaviness ensure a solid unmoving base when you're doing your cutting. This allows you to better control your cuts without them getting skewed or warped since you have a strong stand to keep the cuts clean. This also makes using the band saw safer since you won't accidentally have the blade slip unto your person. The unit features a good ratio between cost and performance. The 14-inch version of the WEN 3962 Two-Speed Band Saw justifies its $493.02. In contrast, the trade-off of sturdiness for a lower price of $136.76 is a fair deal (it's even lower than some portable units). For good or for ill, you get what you pay for. Pound for pound, each and every version of the WEN 3962 Two-Speed Band Saw has the best possible cutting capacity for a saw their size, whether it's the 9-inch, 10-inch, or 14-inch band saw you're using. Just watch out for adjustment issues across the board (the main Achilles Heel of the WEN line of band saws). It's available for purchase in three variants: 9 inches, 10 inches, and 14 inches. You're ensured of the cleanest cuts thanks to the unit's cut capacity of 6 inches deep and 9¾ inches wide. The unit makes use of any 72-inch that's anywhere between ⅛ to ½ inches in terms of size. The work table is spacious and offer 45-degrees of bevel up angle changes. Adjusting its settings can get quite maddening. From what I've gathered, the long and short of the social proof or reviewer consensus on the WEN 3962 Two-Speed Band Saw with Stand and Worklight is that it's excellent enough to get an above average customer rating but it could've been higher had it not suffered from serious flaws. These detriments aren't quite enough to compel buyers to send the unit back to the shopping site, but it was enough to have them give them poor ratings. In my opinion, at least one reviewer got it right in regards to the size and performance discrepancies between the three sizes of the WEN 3962. The smaller the unit, the less horsepower it gets yet the more vibration it ends up having despite its stand and its weight. This also explains why the 9-inch version of the unit costs about half of what a portable band saw has. With that said, the cutting performance of the WEN 3962 10-inch version is as good as it gets for a band saw under $500. Just set it up correctly and you're good to go. The 10-inch WEN 3962 is probably the most cost-effective unit of the three, with the 14-inch one being more expensive and the 9-inch one being too flimsy. In conclusion, the 9-inch version might not be worth the $100 price tag, the $200 10-inch version is a good halfway point, and if you can afford the $500 14-inch version instead go for that to play it safe. You have several alternative choices for the WEN 3962 Two-Speed Band Saw with Stand and Worklight. Most of them are portable and two of them fellow stationary band saws. The Makita XBP02Z 18V Portable Band Saw advertises itself as a band saw with benefits in terms of comfort, control, speed, and durability. It has an impressive 275 to 530 FPM cutting speed and more variable speed control settings compared to the WEN 3962 Two-Speed Band Saw. It's also amazing that for a saw its size, it has a cut capacity of 4¾ inches (not to mention its flexibility as a portable hand tool). However, in another point of view, the WEN 3962 is no only superior with its 6 inches cut capacity but also its whopping 1,520 or 2,620 FPM cutting speed. What it lacks in cutting mobility, it more than makes up in sheer cutting power. The Milwaukee 48-08-0260 claims to be durable, easy to use, and "portable" by only weighing 34 pounds (which, in fairness, is significantly less than the WEN 3962 weighs, which is 73 pounds with stand included). It's not a hand tool band saw but you can move it around easier than the 3962 unit. Then again, this band saw model has a significantly lower rating than even the WEN 3962 Two-Speed Band Saw because it's quite frankly a disappointing saw compared to its portable versions. Even with its heavy-duty clamping chain and crank nut securing tools and its ability to be mounted on any work bench, many users down vote it for its lack of a stand. In line with the DEWALT legacy of excellence, the DEWALT DCS374B has all sorts of impressive specs. One particular spec stands out from the rest in comparison to the WEN 3962 Two-Speed Band Saw: The DEWALT DCS374B has a 5-inch cutting capacity that's only an inch short of what a stationary band saw can cut. This is impressive in light of the fact that the DCS374B is portable. Like the Makita band saw, this DEWALT band saw can also shift from one gear to the next in terms of speed with its variable speed dial and trigger to ensure control and versatility. However, the WEN 3962 Two-Speed Band Saw still has the more powerful motor and it doesn't need a battery or an integrated hanging hook for storage either. The SKIL 3386-01 2.5-Amp 9-Inch Band Saw is a fellow stationary or tabletop saw like the WEN 3962 Two-Speed Band Saw and the Milwaukee 48-08-0260 Band Saw Table. This unit's main claims to fame are its rip fence and a large dust port for easy cleanup afterwards. It however doesn't come with a stand but outdoes its Milwaukee counterpart by having 3½ inches cut capacity versus 3¼ inches (for those who can't do the math, ½ is double of ¼). The WEN band saw still outdoes both by having 6 inches of cut capacity and a weightier mass of 73 pounds. The second Milwaukee band saw on this list, ironically enough, compares more favorably with the WEN stationary band saw even though it's a portable power tool and the first Milwaukee band saw is actually a fellow stationary band saw. This is because the Milwaukee 2429-20 offers more pound-for-pound compared to its table variant with its compact and lightweight 6.6-pound body that's capable of deliver 1⅝ inches, which is impressive for a machine its size. It is many magnitudes less strong than the monster that is the WEN 3962 Two-Speed Band Saw but it delivers enough cutting power for more mobile work. If I could have only one power tool in my shop, it would be a band saw. 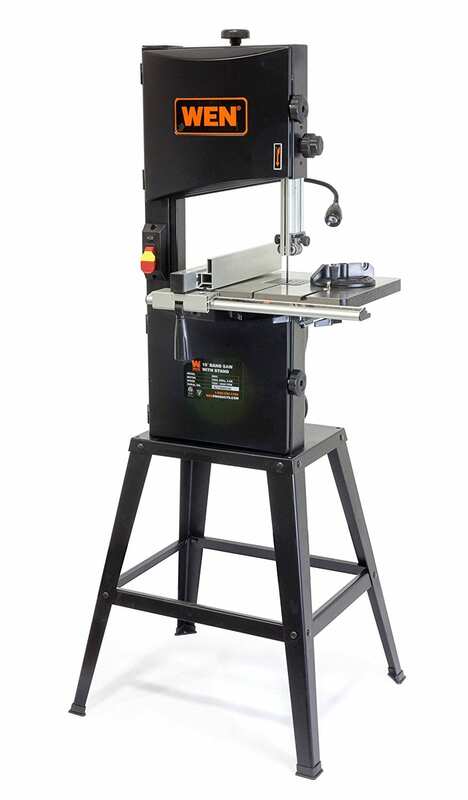 Although the portable or power tool version of this saw has superior maneuverability in cutting items that are bolted or nailed down (that is, work pieces you can bring to a stationary unit's table), the cutting power and depth of the WEN 3962 Two-Speed Band Saw (check for lowest price online) is significant enough to outdo just about every portable band saw option out there. Long story short, I honestly believe that the 10-inch version (whose specs are being used on this review) is worth its cost if you can't afford the 14-inch. It lies on that sweet spot between the balancing act of low price and quality performance. It could've had a higher rating in light of its impressive performance if it's not a pain in the neck to set it up just right from out of the box.